Having thoroughly enjoyed the first two books in the Montmaray Journals trilogy, A Brief History of Montmaray and The FitzOsbornes in Exile (reviewed here), I was very keen to read the final book, The FitzOsbornes at War. Because Michelle Cooper unfortunately does not have a British publisher, I ordered up the book from Gleebooks in Australia. I was told the book would arrive in 10-15 working days. It showed up much faster than that, arriving just under a week later! And then I read it in about 24 hours. Cooper uses a lovely, clear prose style for Princess Sophia's journal, so that the novels are all very fast reads. 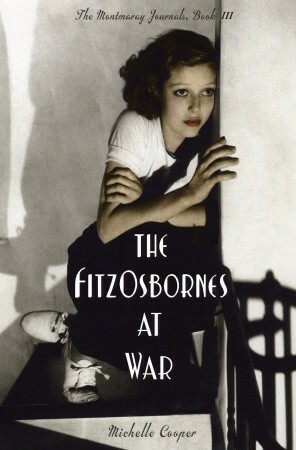 At the end of Book Two, which leaves the royal FitzOsborne family (Sophia, her brother Toby and sister Henry, plus cousin Veronica and half-cousin Simon) just before the outbreak of the Second World War. The three things most on my mind when I finished were: 1) What would happen to Toby and Simon, who had already signed up for the RAF, 2) What opportunities would become available for the girls, whose London lives in Book Two had consisted in large part of their aunt trying to make proper aristocratic marriage matches for them, and 3) Would any of the FitzOsbornes, all well-drawn, sympathetic characters, die in the war? And throughout the war are interwoven the fates of the FitzOsbornes from the outbreak of war to the summer of 1944. I got answers to all my questions. 1) Simon and Toby definitely become involved in the war, with Toby flying fighter planes and facing a great deal of danger. I worried along with Sophie what was to become of both young men. 2) Sophie and Veronica and even socialite Julia from the first two books take on wartime service: Sophie in the Food Ministry, Veronica with the Foreign Office putting her knowledge of Spanish to good use, and Julia serving as an ambulance driver. 3) And yes, a beloved character dies, which had me absolutely bawling. I was very impressed by the FitzOsbornes final, brave, and actually rather believable plan to take back Montmaray from the Germans. I was also pleased by the epilogue written by Sophia in the 1948, which explains the post-war fates of the characters, including children, professions, and the ultimate fate of Montmaray. Now, I have a very few quibbles regarding the series overall. Throughout the first two books, I wondered how the author would come up with a satisfying ending for Toby, whose homosexuality is definitely part of the story. He is accepted by his family, but homosexuality was still illegal in Britain at this time. (See, for instance, the sad story of Alan Turing, codebreaker at Bletchley Park and father of computer science, who was prosecuted for his homosexuality in 1952.) Another tricky aspect of the story I wondered over was the post-war fate of the main characters, who belong to a royal family, but who will enter into a Britain dominated by the Labour government, nationalization, and the decline of the aristocracy. Cooper resolves these problems in ways that are eminently satisfying to the reader who is invested in these characters' welfare. On the other hand, the ending, dare I say it, might be a bit too happy and easy? It's hard to say. My other quibble is perhaps a little harder to explain. I sometimes felt that Sophia, whose siblings and friends are involved in major ways in the war and the politics surrounding it, especially as the royal family of a technically combatant nation, sometimes came off as slightly ignorant or indifferent to the historical events happening around her. I know part of this is likely a narrative device, to provide the contemporary teen (or adult) reader with historical and political information as Sophie learns it. I am also aware that Sophia is not nearly as politically minded as Veronica. But it sometimes seemed that Sophie should have had more of an interest in, say, the Italian front, and this made her characterization seem slightly uneven at times. These are small quibbles, and don't detract from the overall strength of the trilogy as a whole. To finish, I will also say that I was impressed by the way that Cooper handles the sexuality of her characters, which by the third book have almost all entered adulthood. They discuss and consider their own attitudes toward sexual experience prior to and after marriage and think critically about how their views mesh with those of 1930s and 40s "Society". Veronica even comes out against matrimony, as a clearly thought through stance. Because we have watched Veronica's intellectual development and her feminist politics, this rather unorthodox position on marriage isn't all that surprising and reflects her principles (especially since she would lose her job at the Foreign Office if she married). Sophia depicts two sexual experiences, not in any explicit detail, but certainly in ways that illuminate her character and relationships with men. Overall, this is a fabulous historical YA series and I feel rather sorry for readers (like my mom) in North America who have to wait for the October release date to find out what happens to the FitzOsbornes.